This past Key West Race week I sailed with the newest Farr 280 owner Chris Pesch on Swordfish. The Farr 280 is relatively new to the racing circuit and brand new to me. I had never met Chris before either. I had a few references and after an introductory phone call with him I felt encouraged and grateful to be sailing with him. As it turns out, Chris too had never sailed the Farr 280 other than a short intro sail before buying the boat. Nevertheless, tickets were purchased and off I went to Key West. Swordfish showed up to Truman Annex two days before the event, still wrapped up in its original packaging. After a lot of work we had her in the water and ready to race by day one. We competed in the 8 boat ORC 2 class. Our learning curve was steep and a few adjustments to the boat had to be made but by day three we felt as if we had been sailing the boat all year. Chris’s story is one that, in this new age of small boat one design racing, brings hope and promise to the sport of sailing. He grew up spending his summers in Martha’s Vineyard with his family. Bored with sitting on the beach, he found himself an old Snark and through local sailing literature he taught himself the basics. Not long after, Chris joined his local club and his love for the sport grew. He spent his first two years of college sailing for Arthur Knapp at SUNY Maritime Academy. He enjoyed the structured sailing practices and used the time to really hone his skills as a helmsman. After college he stayed current with the sport, sailing what he could as often as possible. He competed in a range of classes from Farr 40s to one-tonners to a range of IMS boats. Once Chris settled down and started a family his time commitment to the sport was limited. He moved a few times and didn’t own a boat so he wasn’t able to compete. Finally ending up in Fort Lauderdale, he worked his way back into the scene with his brother in a J boat and re-discovered his love for the sport. He decided to invest in a boat and came to Annapolis to test the Farr 280. He was looking for a state-of-the-art small boat that could be left on a trailer and easily packed up for travel, but his main focus was sailing with his son, Patrick. They sailed a small amount when Patrick was younger and as he grew he did a bit of his own sailing as well. But they were searching for something they could both sink their teeth into and enjoy together or individually with limited headache. There is nothing like a high performance sailboat to bring families closer. Sailing with family, although often challenging, can be one of the most rewarding experiences one could hope for. 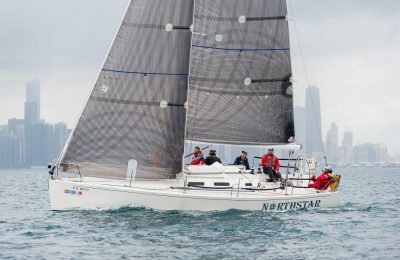 Chris settled on the Farr 280 because he liked the ease and stability of the boat and was pleasantly amazed by the power and the precision at all points of sail. It was both state-of-the-art yet accessible and simple enough to master. Rigging and tuning were made easy by an adjustable mast jack. Most importantly the boat looks amazingly cool! The Farr 280 is a blend of the grand prix racing scene, with its ever-advancing technological aspects, and hyper-competitive one design fleets that are currently attracting sailors from all levels of the sport. The racing community often debates the “trickle down effect” of technology innovation. Are high-end sails such as 3Di™ necessary in these markets? Chris seems to think so. He describes the sails as nothing short of perfection. When you boil it all down it’s a matter of simplicity. 3Di gives us the ability to be exact, to change our margins by such a small amount that when you look up at a sail you think maybe one more click of trim and we’re there. Are high-end sails such as 3Di™ necessary in these markets? Chris seems to think so. He describes the sails as nothing short of perfection. A puff comes and we ease out two inches, let the boat accelerate and bring the sheet back in one or two clicks. But here is the important part, in Key West we could do that for five days straight in heavy air conditions! It’s hard to appreciate the value of that until you’re the one sailing the boat, or more precisely the one trimming. So when undeniably good sail trim is more available to the masses it makes it more fun and exciting for all of us. Every time I looked back Chris was beaming. I could tell this boat was allowing him the opportunity to have a great time with his son and not punishing him in the high winds and big waves. Sailing with Chris and his family reminded me of why I have come to love this sport. With a great love of sailing comes hard work and commitment and any good sailboat will reward both many times over. The Farr 280 and boats like it serve many purposes – the most important I see is to bring that love back to our sport. These boats combine awe inspiring, cool features with the most basic and fun principles to make competitive boat racing what it needs to be again. It is a lot to handle, even with an experienced crew, but it also allows for flexibility and diversity in the team. As professional and expensive as the sport has become, we can still strive to maintain the enjoyable aspects while advancing technology. If you have found yourself pushed away by huge hyper-competitive one design classes or mismanaged local fleets with under-maintained equipment – take another look. The answer may be where you least expect it to be.